First, the more products you list on Amazon.com, the faster your chance of selling one. Amazon recommends sellers post at least 40 products. Having more products listed overall will give you a better chance of your products showing up in a potential buyer’s search path. Second, because the same product can be sold by multiple sellers, you want to strive to become a Featured Merchant and win the Buy Box for that product. 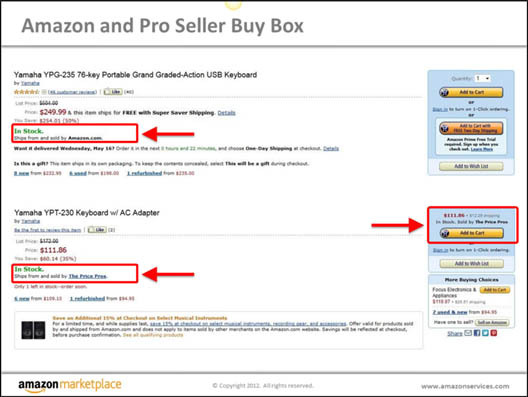 Above, you will see the product Sold by Amazon.com at the top, with the Buy Box winner listed 2nd. Winning the Buy Box listing is best way to gain the attention of Amazon shoppers. Only a professional seller (not an individual seller) can become a Featured Merchant and therefore compete for the Buy Box listing. Featured Merchants compete for the Buy Box listing by meeting Amazon.com’s list of criteria which includes providing exceptional customer service, dependable and fast delivery rates and great product reviews. Your Featured Merchant status can vary by category, so just because you win the Buy Box for one type of product, does not make you a winner for another. Amazon looks at a seller’s overall ODR (Order Defect Rate), meaning how many returns and charge backs they have generated when choosing the winner. They also take into consideration the time and experience a seller has participating in Amazon.com Marketplace. 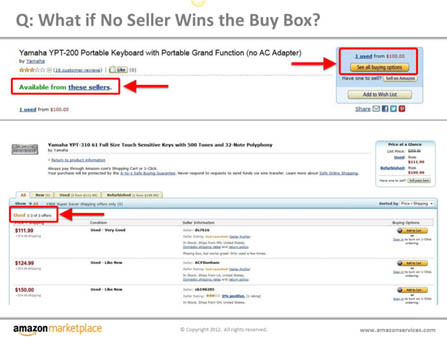 If no sellers qualify for the Buy Box area, then all sellers are listed below the Amazon listing. This is where your customer service and product reviews will be critical. Amazon also recommends that sellers user its FBA (Fulfillment By Amazon) feature on fastest-selling items. Maintaining low return rates and negative reviews area also key factors to successful selling on Amazon. Are you a seller on Amazon.com? Have you discovered a strategy to help you sell more products? I’d like to hear about it. Leave a comment on this blog, or email me directly for possible inclusion of your story in my upcoming book. This entry was tagged increasing online sales, selling on amazon. Bookmark the permalink. ← Do you have a Social Media Success Story to Share? I do have a tip. We are growing at around 30% a month on Amazon. Obviously we follow the important rules around getting good feedback and reviews and giving excellent customer service. But our main competitive advantage is that all our products are unique on Amazon so we have no competition for the buy box. Every day our buy box percentage is between 95-100%. The way we have done this is to forge a link with a company abroad and do a deal to be the sole suppliers of the product in the UK. Thus we own the bar codes lock stock and win the buy box all the time. It’s working for us hence the growth.